I have been picking about 5 pounds of grapes every afternoon after work and coming in to make jams and jellies. Instead of of stretching these posts out over days and weeks I decided to give you a twofer today. I love my vintage Farm Journal Country Cookbook and most of my preserve recipes have come out of there this year. 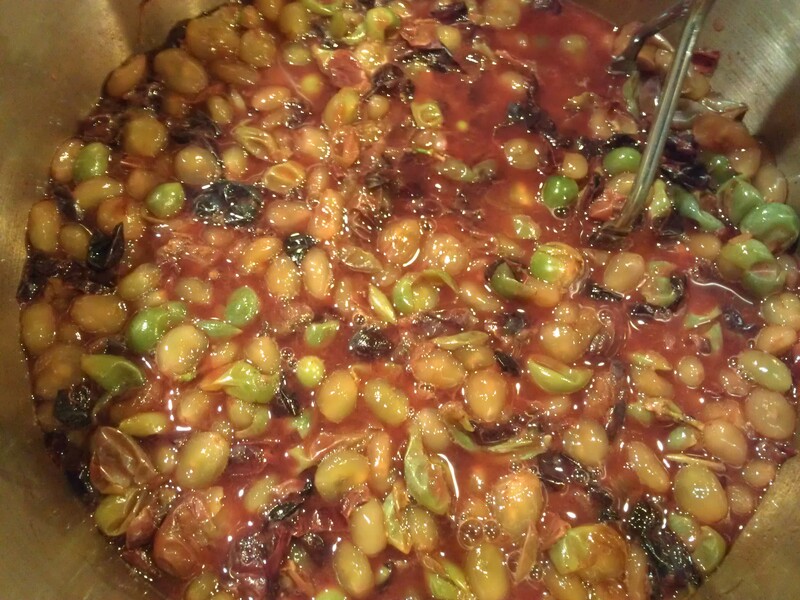 Cook grapes in a large kettle with spices and vinegar. Use a potato masher and crush grapes while they are cooking. After juice forms, boil 5-10 minutes. 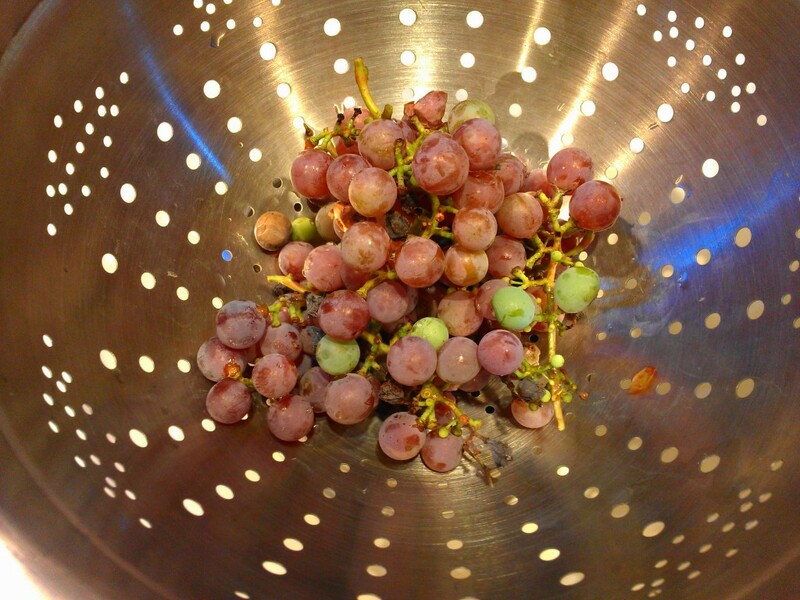 Strain juice by running it through a chinois and pressing the grapes, separating the seeds and the grape peels. (Discard these. For a super clear jelly, use cheese cloth to further strain the juice. I skip this step and simply use my chinois. Return juice to kettle and add sugar. Heat, stirring, and boil rapidly to jelling stage (219 degrees). Add pectin and stir hard. Boil for 30 seconds. Skim; pour quickly into hot sterilized glasses. Seal at once. Makes about 12 (6 oz. jars). This recipe made the kitchen smell wonderful. I know this will be wonderful on PBJs. But, I have to confess, I don’t know how it will turn out. I added the pectin, whisked it in, and set the timer for 30 minutes (not 30 seconds as the recipe called for). After about four minutes, I realized it was looking a bit different than any other jelly I had ever made. I went ahead and canned it up. We will see…. My next recipe turned out much better because I read the directions more carefully. Juicy purple grapes and oranges get together with raisins and nuts. 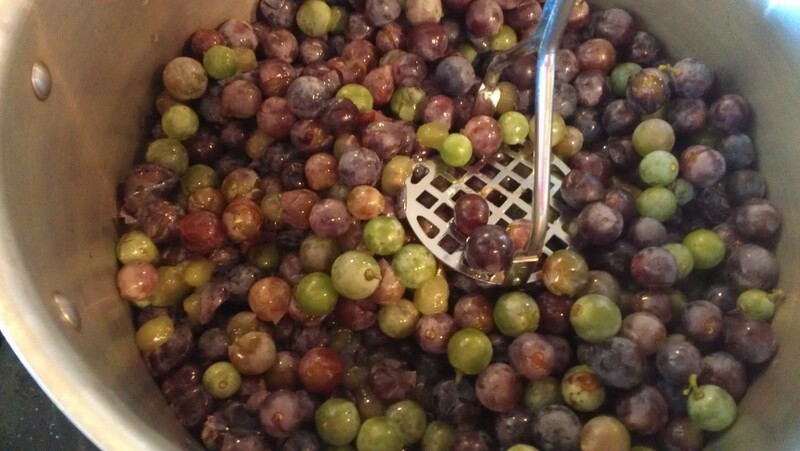 Place grapes in a kettle and cook. Use a potato masher to smash grapes to release juice. Cook until seeds can be separated by forcing pulp through strainer. 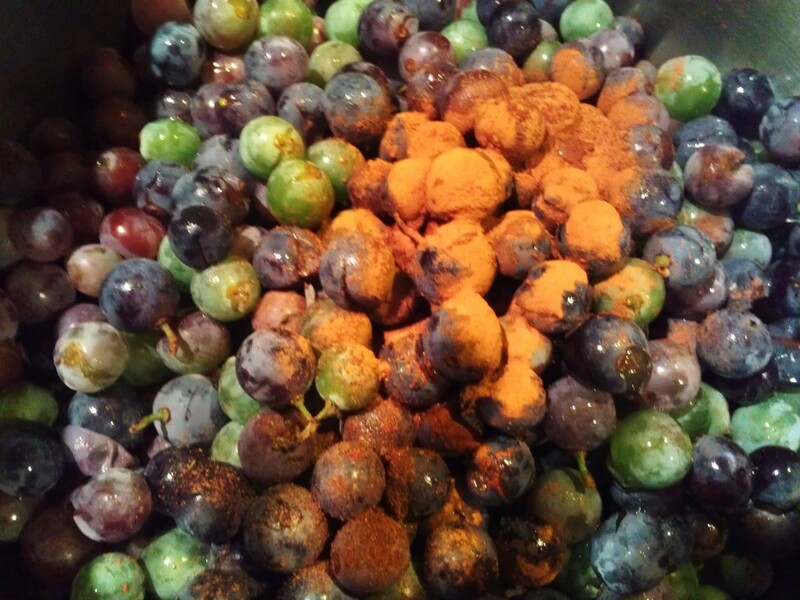 Combine grape pulp with sugar, orange juice, water, and salt. Bring to a boil. Add raisins. Simmer 20 minutes or until thick. Add nuts; cook for a few minutes more. Pour into hot sterilized jars. Seal at once. Makes about 5 pints. I am so scared that I will poison someone when home canning (and really, this has never happened). I also don’t own a pressure cooker because my grandmothers scared me to death with their old hissing monsters and stories of these things blowing up and impaling people with metal shards. 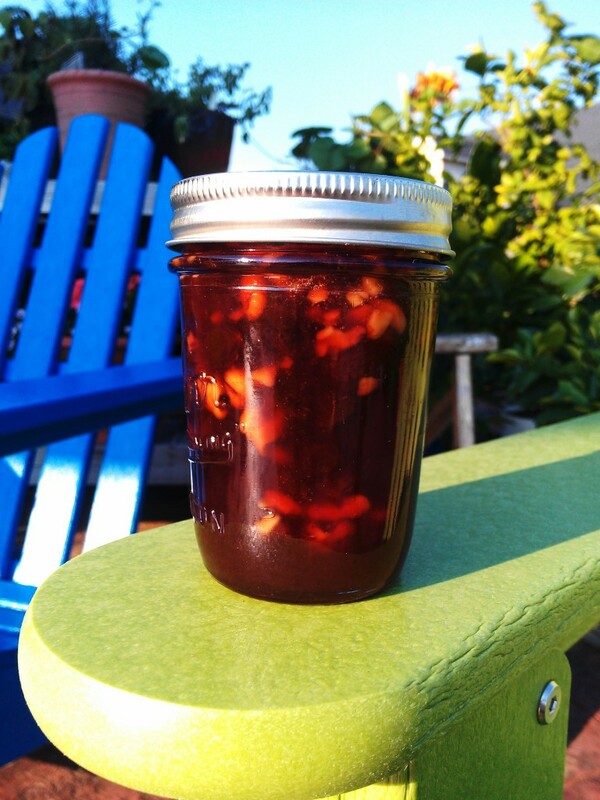 But, whether or not a recipe calls to water bath jams, jellies, or pickles, I do it anyway. I set my jars back in a boiling water bath and processed them for 10 minutes for both these recipes. Abby, my chives are blooming again. Hugs and giggles today sent specially to you Abigail. 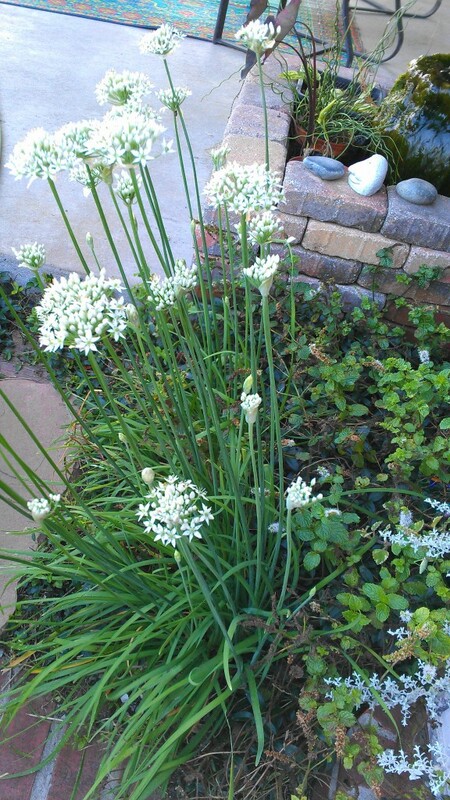 Your chives are blooming so beautifully! I guess the jelly or jam all require to use pectin…or I can actually substitute it with something else? Actually Angie, I usually don’t use pectin. 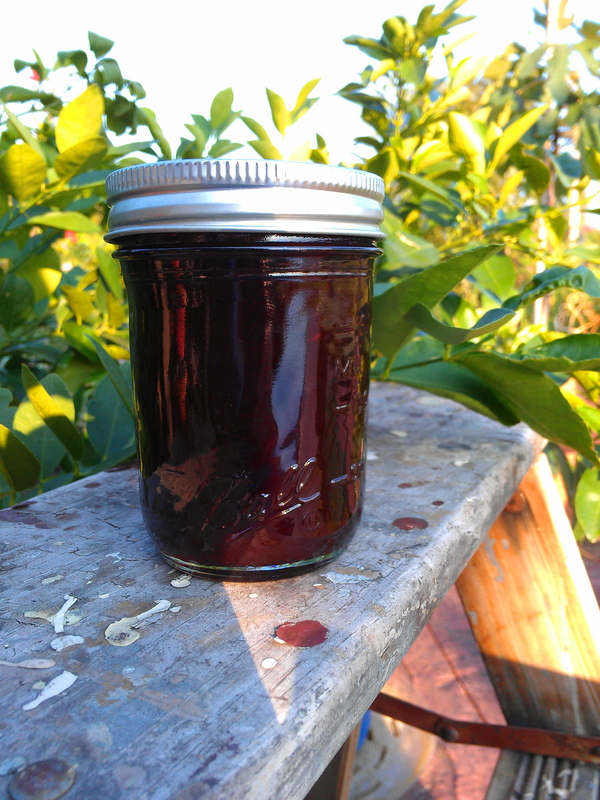 I probably won’t use pectin when I make the spiced jelly again. Eeeesh! I hate it when I read recipes wrong! I bet it still tastes wondahful!!! PBJs are off the hook! It will be fine! I make my conserves this way and 2 years ago won a blue ribbon at the state fair with my Cherry Pecan Conserve – and I water bathed it too. For Angie’s question above – just let the temp reach 220 F and that will set it – but don’t do it on a rainy/stormy day – it will never set! Atmospheric pressure is a killer of good jelly! I did not know that about the humidity. So, when can we make jam in Oklahoma? right now is GOOD!! There’s less humidity in the air than usual – back when you couldn’t get any made in the last month? It probably wouldn’t have made anyway! 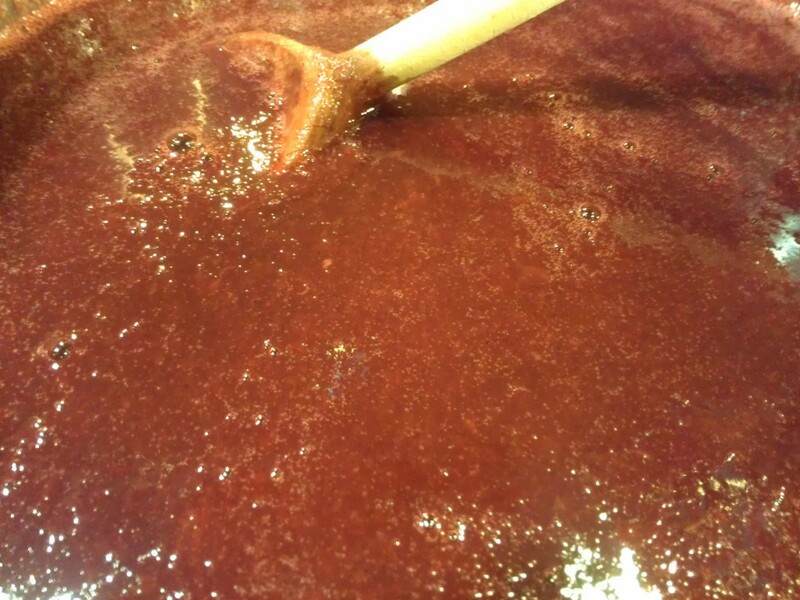 I love that cinnamon in this jam, yummy yum yum! Also I am terrified of pressure cookers, very very scared! Yep. I am right there with you. I probably will never own one. A little difference between 30 seconds and 30 minutes. 🙂 Good luck with the results. It sounds delicious. The grape conserve is quite interesting with the walnuts. I have a friend with lots of grape vines and am hoping for a great year! 🙂 Thanks for sharing these recipes because I might need them soon. I hope you are referring to the children’s book Jamberry. I have read it at least 500 times and enjoyed every one. All your jams and jellies look wonderful. You are one amazing lady–you could just inspire me to make so jelly. Thanks! I love this jam, though I use cider vinegar and only 7C of sugar. It is also known as Venison Jelly, as it is wonderful with venison. Good to know. Thanks, Heidi.